Roundhouse Urbo and Classic matt lacquer hand painted, luxury bespoke kitchen. Urbo in Farrow & Ball Hardwick White and Classic in Farrow & Ball Downpipe. Worktop in Honed Basaltina Limestone with pencil edge and splashback in stainless steel. Photography by Darren Chung. A HOME THAT APPEALS TO ALL THE SENSES Inspired by this client's passion for sights, smells and love of 18th Century Belgian interiors, this incredible London home has astonishing attention to detail, incredible flair and an overwhelming commitment to long-held design concept. 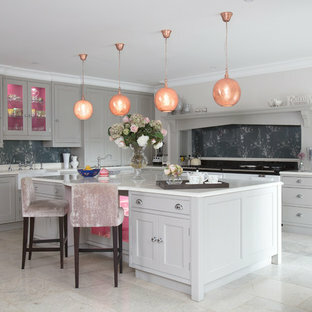 The main kitchen design included a bespoke La Cornue Château range cooker, sourcing a magnificent Louis XIV mantel from France, creating a beautiful writing desk with aged oak surface, a curved full high cupboard with TV storage and a fabulous island centrepiece with beautiful turned pilaster legs, open cutlery storage and marble surface. Architect Nils Finne has created a new, highly crafted modern kitchen in his own traditional Tudor home located in the Queen Anne neighborhood of Seattle. The kitchen design relies on the creation of a very simple continuous space that is occupied by intensely crafted cabinets, counters and fittings. Materials such as steel, walnut, limestone, textured Alaskan yellow cedar, and sea grass are used in juxtaposition, allowing each material to benefit from adjacent contrasts in texture and color. 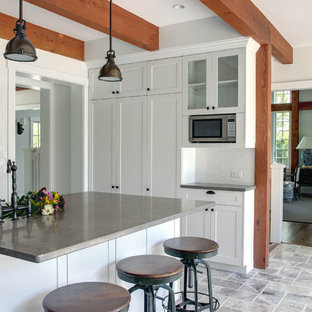 The existing kitchen was enlarged slightly by removing a wall between the kitchen and pantry. A long, continuous east-west space was created, approximately 25-feet long, with glass doors at either end. 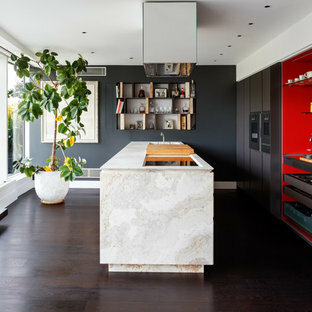 The east end of the kitchen has two seating areas: an inviting window seat with soft cushions as well as a desk area with seating, a flat-screen computer, and generous shelving for cookbooks. At the west end of the kitchen, an unusual “L”-shaped door opening has been made between the kitchen and the dining room, in order to provide a greater sense of openness between the two spaces. The ensuing challenge was how to invent a sliding pocket door that could be used to close off the two spaces when the occasion required some separation. The solution was a custom door with two panels, and series of large finger joints between the two panels allowing the door to become “L” shaped. The resulting door, called a “zipper door” by the local fabricator (Quantum Windows and Doors), can be pushed completely into a wall pocket, or slid out and then the finger joints allow the second panel to swing into the “L”-shape position. In addition to the “L”-shaped zipper door, the renovation of architect Nils Finne’s own house presented other opportunity for experimentation. Custom CNC-routed cabinet doors in Alaskan Yellow Cedar were built without vertical stiles, in order to create a more continuous texture across the surface of the lower cabinets. LED lighting was installed with special aluminum reflectors behind the upper resin-panel cabinets. Two materials were used for the counters: Belgian Blue limestone and Black walnut. The limestone was used around the sink area and adjacent to the cook-top. Black walnut was used for the remaining counter areas, and an unusual “finger” joint was created between the two materials, allowing a visually intriguing interlocking pattern , emphasizing the hard, fossilized quality of the limestone and the rich, warm grain of the walnut both to emerge side-by-side. Behind the two counter materials, a continuous backsplash of custom glass mosaic provides visual continuity. Laser-cut steel detailing appears in the flower-like steel bracket supporting hanging pendants over the window seat as well as in the delicate steel valence placed in front of shades over the glass doors at either end of the kitchen. At each of the window areas, the cabinet wall becomes open shelving above and around the windows. The shelving becomes part of the window frame, allowing for generously deep window sills of almost 10”. Sustainable design ideas were present from the beginning. The kitchen is heavily insulated and new windows bring copious amounts of natural light. Green materials include resin panels, low VOC paints, sustainably harvested hardwoods, LED lighting, and glass mosaic tiles. But above all, it is the fact of renovation itself that is inherently sustainable and captures all the embodied energy of the original 1920’s house, which has now been given a fresh life. The intense craftsmanship and detailing of the renovation speaks also to a very important sustainable principle: build it well and it will last for many, many years! Overall, the kitchen brings a fresh new spirit to a home built in 1927. 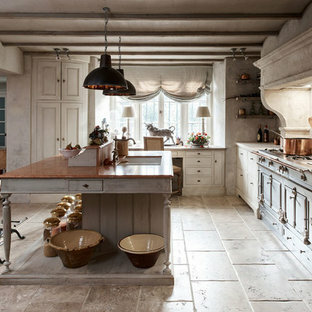 In fact, the kitchen initiates a conversation between the older, traditional home and the new modern space. Although there are no moldings or traditional details in the kitchen, the common language between the two time periods is based on richly textured materials and obsessive attention to detail and craft. Yankee Barn Homes - The post and beam kitchen has an open floor plan with easy access to both the great room and the dining room. 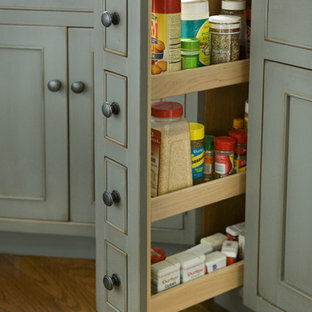 Grey painted kitchen pantry pull-out designed by North Shore kitchen designer Nancy Hanson owner/designer Heartwood Kitchens of Danvers MA - a best of Houzz winner 2013 & 2014. An antique Chinese frieze hangs above this kitchen’s original fireplace. Bronze farm sinks, bronze hardware and a bronze raised bar are accented by fossil limestone countertops; a subzero wine refrigerator, dishwasher drawers, a Wolf gas, five-burner cooktop and a restaurant-style faucet of brushed nickel, giving this kitchen a gourmet touch. The flatscreen television on an articulating arm makes it even more tempting to spend hours in this family’s favorite spot! An original brick fireplace and woven wood blinds add warmth alongside the many stainless steel appliances. A light tile backsplash, ceiling, lights, and glass leaded cabinet fronts provide a good contrast that keeps the kitchen, with its dark cabinets, from being heavy and oppressive. A remodel of a small home, we were excited that the owners wanted to stay true to the character of an Arts & Crafts style. An aesthetic movement in history, the Arts & Crafts approach to design is a timeless statement, making this our favorite aspect of the project. Mirrored in the execution of the kitchen design is the mindset of showcasing the craftsmanship of decorative design and the appreciation of simple lines and quality construction. 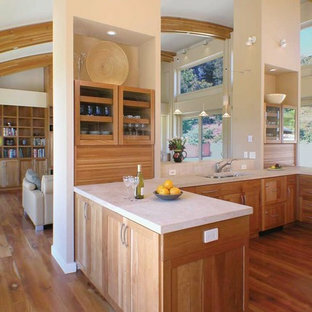 This kitchen sings of an architectural vibe, yet does not take away from the welcoming nature of the layout. Project specs: Wolf range and Sub Zero refrigerator, Limestone counter tops, douglas fir floor, quarter sawn oak cabinets from Quality Custom Cabinetry, The table features a custom hand forged iron base, the embellishment is simple in this kitchen design, with well placed subtle detailing that match the style period. A spacious Tudor Revival in Lower Westchester was revamped with an open floor plan and large kitchen with breakfast area and counter seating. The leafy view on the range wall was preserved with a series of large leaded glass windows by LePage. 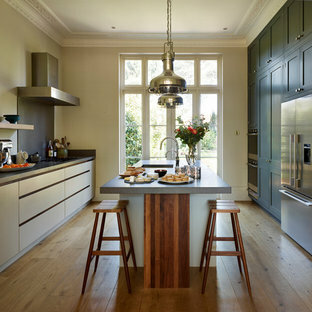 Wire brushed quarter sawn oak cabinetry in custom stain lends the space warmth and old world character. 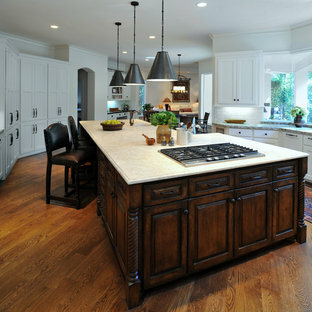 Kitchen design and custom cabinetry by Studio Dearborn. Architect Ned Stoll, Stoll and Stoll. Pietra Cardosa limestone counters by Rye Marble and Stone. Appliances by Wolf and Subzero; range hood by Best. 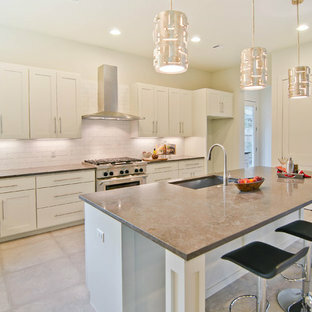 Cabinetry color: Benjamin Moore Brushed Aluminum. Hardware by Schaub & Company. Stools by Arteriors Home. Shell chairs with dowel base, Modernica. Photography Neil Landino.